A function F is called an antiderivative of f on an interval I if F’(x) = f(x) for all x in I.
where c is an arbitrary constant. 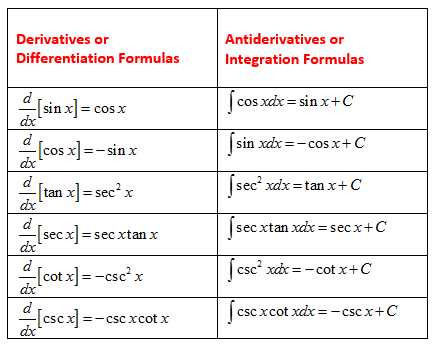 The tables shows the derivatives and antiderivatives of trig functions. Scroll down the page for more examples and solutions on how to use the formulas. The reverse of differentiating is antidifferentiating, and the result is called an antiderivative. A function F(x) is an antiderivative of f on an interval I if F'(x) = f(x) for all x in I. You can represent the entire family of antiderivatives of a function by adding a constant to a known antiderivative. So if F(x) is the antiderivative of f(x), then the family of the antiderivatives would be F(x) + C.
The process of antidifferentiation is often called integration or indefinite integration. When we find a function's antiderivative we are actually finding a general solution to a differential equation. A differential equation in x and y is an equation that involves x, y, and the derivative of y. What is the Indefinite Integral or Anti-derivative? An introduction to indefinite integration of polynomials. This video has a few examples of finding indefinite integrals of trig functions. Antiderivatives are the opposite of derivatives. An antiderivative is a function that reverses what the derivative does. One function has many antiderivatives, but they all take the form of a function plus an arbitrary constant. Antiderivatives are a key part of indefinite integrals. Finding the antiderivatives of a function require a little backwards thinking. Since the derivative of the wanted antiderivative is the given function, checking for correctness is easy. You just take the derivative, and see if it is the given function. Also, antiderivatives of functions happen to be not just one function, but a whole family of functions. This family can be written as a polynomial plus c, where c stands for any constant.